The mark of a great guitarist is the nuances in his/her playing. Sure, I like to play fast too like many others here, but the more I listen to music the more I appreciate things like phrasing and dynamics. In fact, I found that all the guitarists that I appreciate AND all the guitarists who have a good tone are masters of dynamics. And conversely, every time I hear someone whose solos sound "flat", "plain", "all the same", it's invariably a guitarist who is not controlling his/her dynamics. What does "dynamics" mean? "Dynamics" in music (to give a simple but imprecise definition) is simply how loud you play. It's of course more complex than that: to make an example that is close to the experience of all guitar players, if you play with distortion you can try to pick harder, but the distortion compresses the signal so the actual volume will not change (much). But your tone WILL change: if you pick louder you get more distortion and more harmonics in the sound of the string. So controlling your dynamic is simply controlling how hard you pick (at least for the scope of this article - it can get much more complex than this, but let's keep it simple for the time being). And mastering dynamics will allow to accent any note at will, which in turn helps you manipulate your tone in real time. Yes, it's THAT simple. In fact you do not have to invest any more time in practicing than you do now: you just need to do what I show you in the video WHILE you practice your regular exercises. Have fun with it! 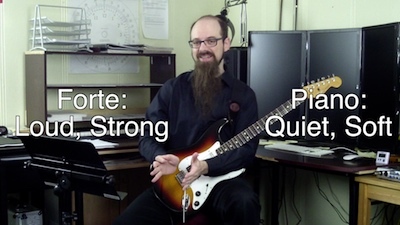 And if you need more help with learning guitar, check out these music theory guitar courses that make much easier for you to know what to play on your guitar and why.